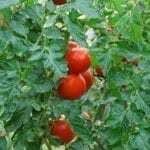 Our tomato plants are large and healthy with lots of leaves but no tomatoes. There are a lot of blooms. What can we do to get tomatoes? We are in Louisville, Ky.